A lot of things where said about this album before it’s release. Singer Andy Hull mentioned in an interview that it sounds like Weezer and that it was an angry album. Alternative Press wrote in their five star review that it was a southern rock album. All of these comments and others had me a bit worried. I’m not a fan of most of Weezer’s cataloge and I hate when bands try to sound like other bands. I’m also not a big fan of southern rock and I thought it was weird that Hull would say the album was angry. I mean the guy just got married, what did he have to be angry about. However, there were a number of things about this album that kept me hopeful. Last year Hull had release the second of his solo albums under the moniker Right Away, Great Captain! and it was amazing. He really stepped up his song writing and it had a much more seasoned sound. Last year Manchester release an EP featuring a song called “I Can Feel a Hot One” which was also to be featured on the upcoming LP. That song was one of the best Manchester songs I’d heard up until that point and one of the best songs of 2008. 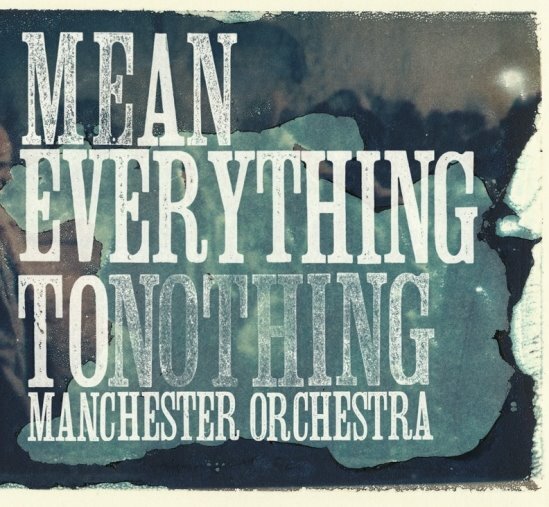 Fast forward to Tuesday April, 21 when Mean Everything to Nothing came out and I listened to it for the first time. I was blown away and hooked from the first listen. Sonically this album is loud and lush, it is a rock album to it’s very core. The production is just fantastic. Each song features blazing guitars, pounding bass, loose drums, and some nice pop synth sounds added for filler. Hull’s vocals often begin each song in his usual fashion, somewhat soft somewhat whiny (not in a bad way) but as the songs build his vocals become more and more ferocious with broken yells and screams (again not it a bad way). And I think that’s what he was talking about when he said the album was angry. He’s vocals certainly sound angry, but lyrically it comes off more as frustration even embarrassment which also somewhat explains the Weezer connection. In a post album release interview Hull mentioned that he was particularly inspired by Weezer’s Pinkerton album which was a very personal and embarrassing album. I can see that to certain degree in Mean Everything to Nothing but as personal as it is it still seems pretty ambiguous especially in comparison to their first album Like a Virgin Losing a Child, which was mostly about Hull’s struggle with his faith. There certainly is an overall theme of self consciousness and questioning self worth, but Hull doesn’t seem to get into the specifics very often. With that said Hull’s song writing hasn’t been better. I mean the guy is only 22 years old and he’s penning some of the best tunes out there right now both musically and lyrically. One thing this album lacks are the softer more subdued songs which are scattered through out the first album. That’s were the Fourteen Years of Excellence EP comes in. Fourteen Years is a rare companion EP which feature three wonderful acoustic numbers and an acoustic version the song Shake it Up. So after getting blow away by the LP it’s nice to throw on the EP to mellow out a bit. At this point the EP I’m guessing is pretty hard to get your hands on but I’m sure it’s available to download online somewhere. One last comparison I wanted to make is the progression of sound this band has made. As great as Like a Virgin was it never really stacked up to Manchester’s live show. Live these guys are gritty, loud, and full of emotion. They one me over so well with their live show I saw them three times in the course of year. The new album however captures their live sound perfectly. I’m actually seeing them tonight at Station 4 in St. Paul and I’m super excited to hear the new songs! Pride – This song features this amazing guitar lick throughout the whole song that would make Tom Morello proud. Shake it Out – By far the most aggressive song on the album. It has a 70’s rock kind of sound with a perfect twinge of Indie rock thrown in the mix and plenty of emotion to go around. Tony the Tiger – I haven’t spent a lot of time with this song but it always make me happy when I listen to it. It’s both somber and poppy, and features some awesome backing vocals and harmonies. Pick up this album people!!! Best of the year so far!! !